You can hang it in your veranda, your courtyard or carry it when you are going camping, climbing, travelling, hiking, picnic etc. Chill out in the sun with this great value hammock. Each hammock is constructed from high quality canvas, meaning a guaranteed durable, safe and comfy hammock. Either end has an attached hanging ring so you can put it up anywhere in seconds. 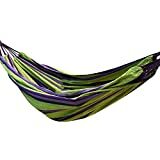 Made to be lightweight and compactible you can fold the hammock away in the included carry bag to take it with you wherever you go and store with ease.